A few months ago, a consultation came out about new proposals to increase court fees for asylum and immigration tribunals by over 500%. At the time, I wrote about it, encouraging people to respond to the consultation to let the government know how outrageous and unjust it would be to increase fees from £140 to £800 for a full hearing in the first-tier tribunals, for example. I was therefore delighted to read that the consultation received 150 responses, of which the vast majority opposed the fees. For example, 142 out of the 147 people who responded to the question about raising fees in the first tribunal opposed the proposition. That’s a phenomenal level of opposition! Considering how hostile attitudes towards migrants and asylum seekers can be, this really underlines how unjust these proposals are. This is a meaningful show of support to those struggling to gain recognition, safety and stability. However, this delight is completely undermined by the fact that the government is paying approximately zero grams of attention to these responses. So if things go ahead as proposed, somebody going through the entire process could now be charged £2,115: an eye-watering increase from £140. The one defence the government offers is that those who are “destitute” or entitled to legal aid are exempt from charges. Firstly, it’s incredibly likely that at least some people entitled to these exemptions will not be familiar enough with the details of the fees or have the support available to press for their rights. But it’s also disingenuous to suggest that £2,000 is an accessible amount for the large proportion of applicants who wouldn’t be eligible for these exemptions. Could you find £2,000 for court fees, on top of legal fees? How about if you had to miss work to see through your case? And what if you weren’t even allowed to work, which is the case for asylum seekers? It’s an outrageous and likely insurmountable barrier. The government response really makes for incredible reading. I cannot work out what the point of holding a consultation was if they are prepared to so lightly ignore the stated concerns of the vast majority of people who responded. It’s important that this isn’t overlooked. Do what you can to tell people that this has happened. Spread the word that the government has actively sought our opinion and then deemed it irrelevant. And the next steps? Well, to start with, don’t let this put you off responding to consultations. What we have here is proof that we have been disregarded; this in itself is valuable. But also be as active as you can as an advocate for the rights of migrants and asylum seekers. If you are based in or near London, you could attend the Refugees Welcome Here march tomorrow (Saturday 17th September), organised by Solidarity With Refugees. Find other events or groups in your area that allow you to amplify your collective voices in support. Respond to negative portrayals of or attitudes towards migrants and asylum seekers, challenging prejudice and hate. While the government has shown scant regard for our voices so far, it expects us to back down. Don’t. The image is by Haeferl and is used under a creative commons licence. 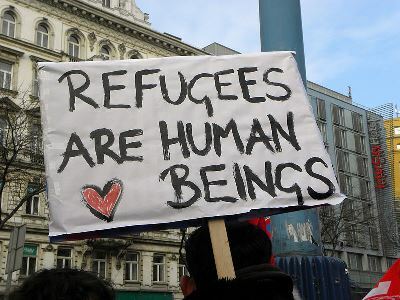 It shows a home-made placard reading “Refugees are human beings” in black paint on a white background; there is a red heart with a black outline in the bottom left corner. It is outside with buildings and a blue sky in the background. The back of a few people’s heads are at the bottom of the image. It was taken at a demonstration in Wien, Germany, called “Gleiche Rechte für alle” (Equal Rights For All).